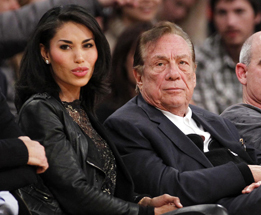 V. Stiviano, the woman whom Donald Sterling was talking to when he made racist remarks, is “very saddened” by his lifetime NBA ban, and she didn’t release the recording of their conversation, her lawyer said Tuesday. Somebody released it “for money,” but it wasn't Stiviano, the attorney said. “My client is devastated that this got out,” he said. “It bothers me a lot that you want to broadcast that you’re associating with black people. Do you have to?” Sterling asks. The Johnson photo has since been deleted from Stiviano’s Insta­gram account. On Tuesday, NBA Commis­sioner Adam Silver condemned the remarks. He banned Sterling for life from any association with the league or his team, and Silver fined him $2.5 million. In March, Sterling’s wife, Rochelle, sued Stiviano, seeking the return of more than $2.5 million in lavish gifts the woman allegedly received from her husband, including luxury cars and a $1.8 million duplex. Stiviano’s attorney has filed documents to dismiss many of the accusations and denies that she took advantage of Sterling, describing him as having an “iron will” and being one of the world’s shrewdest businessmen. Nehoray told the Times that Stiviano and Sterling didn’t have a romantic relationship. She was a hard-working waitress and did volunteer work helping crime victims before becoming an “archivist” for Sterling, he said. “She had no association with any rich people before this,” he said. The Los Angeles County district attorney’s office said Stiviano was a volunteer with its Victim-Witness Assistance Program in 2010 and 2011, the Times said.